The classic dining room has an impressive hand painted wooden ceiling with skylight, and a big table that seats comfortably up to 10 persons. China, tableware and cutlery are available. The large traditional kitchen also has a large eating table by the fireplace. You can also eat outside by the garden. Outdoor furniture and a BBQ are available. 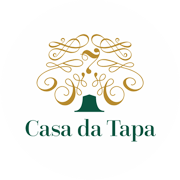 Casa da Tapa offers options for any type of meal: from formal dinner parties to breakfast overlooking the garden, cozy meals by the open fireplace or outside barbeques and events.